Gourmet grilled cheese not as hot as previously thought? Side note: If you watch Shark Tank, you know that one of the most common questions the sharks ask is "is this protected?" or "is this proprietary?" I may be crazy but throwing cheese and bread together and grilling it is about as "protected" as a chain of pie shops called "Ap + Pi." Well placed industry sources indicate at least one local franchise of the Cincinnati, Ohio-based chain wants out of their two locations in Buford and Atlanta. 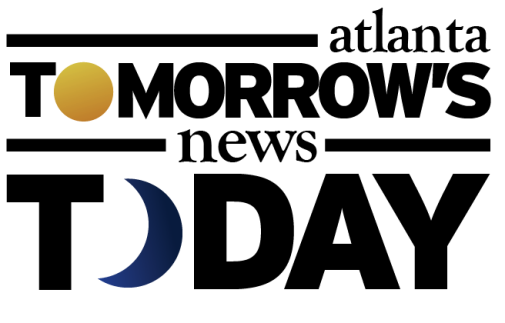 Bibby Donnelly Investments, LLC owns the two restaurants which opened in early 2015 and early 2016 respectively. Victor Bibby and Brian Donnelly are the men behind the franchise and may be well known to those in the banking community for this reason. While I can find no evidence that the duo had prior experience owning or managing restaurants, I feel as though there are a number of factors contributing to what is surely a struggling operation. 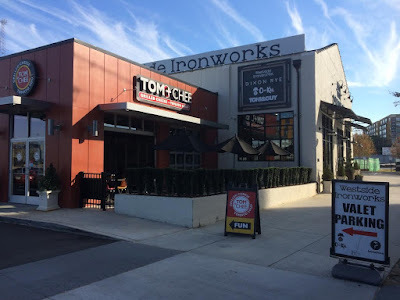 Both the Atlanta restaurant, within the new Westside Ironworks development on Howell Mill Road, and the Buford restaurant, in a new-ish center on Buford Drive near the Mall of Georgia, are in high rent centers. Strangely, the pricing structure, while slightly higher than the menu prices at the Kennesaw location (owned by a separate franchisee) located in a low rent district, is still below what is likely necessary to sustain the business. The basic Tom + Chee sandwich (diced tomato + garlic seasoning + mozzarella + cheddar + hardy white) is $4.95 while The Longhorn (Roast beef + gouda + avocado + tomato + red onion + hardy white) is one of the most expensive items at a mere $6.95. I first questioned the viability of the Westside location early last year when I broke news of its planned opening. If Tom + Chee were doing Jimmy John's-like volume, it might be OK to have such economical menu items. Unfortunately, Tom + Chee is still a growing brand and does not (yet) have the following or market that Jimmy John's has garnered. 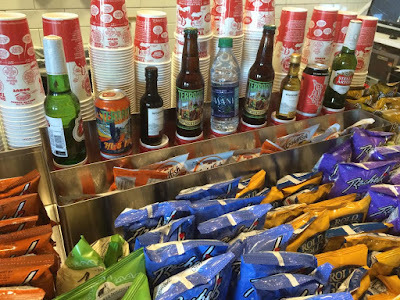 The Atlanta location does offer delivery from services like GrubHub and DoorDash. Additionally, parking is a HUGE challenge at Westside Ironworks. Popular restaurants Barcelona Wine Bar and O-Ku, a sushi restaurant, monopolize much of the center's limited parking for valet service at night. 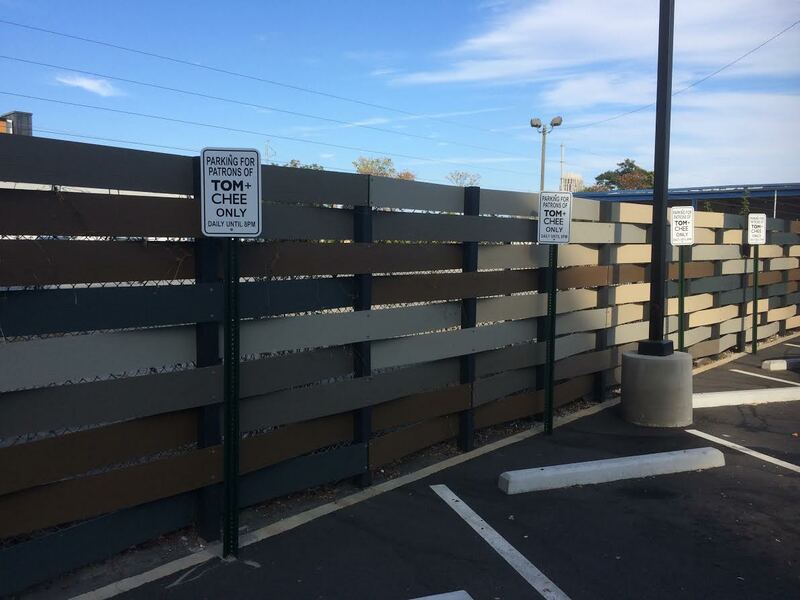 Parking during the day can also be a challenge, so much so, that Tom + Chee has exclusive parking (four spots) until 8PM daily. Tom + Chee is open until nine and even invested in a city of Atlanta alcohol license in an effort to increase revenue. The likelihood of beer & wine sales during the day is limited making the sales during evening hours that much more important, but with limited parking, this plan is hampered. One other striking observation in my visits to both the Buford and Atlanta locations was the use of Stanley automatic sliding door systems. 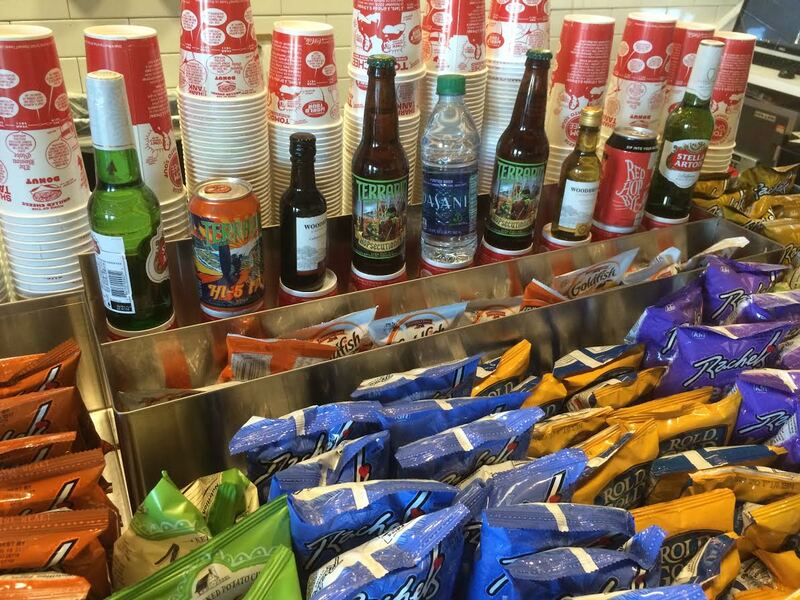 These systems, often found in grocery and pharmacy stores, are a significant expense for an economical restaurant. 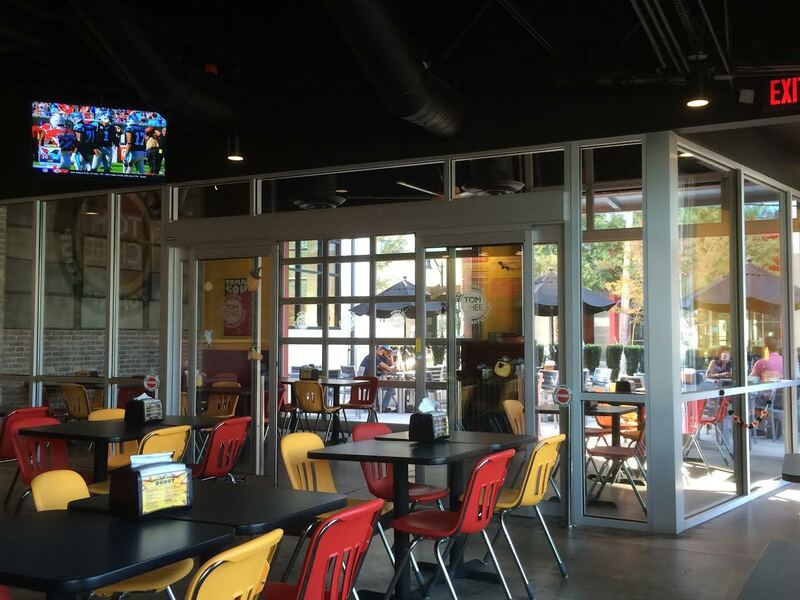 The Kennesaw and Alpharetta restaurants use standard doors, something that perhaps should have been done in Buford and Atlanta. While I truly believe the food is pretty good at Tom + Chee, the chain has been experiencing some growing pains as it continues to open additional franchised units. The chain, which started under a tent near a park in Cincinnati perhaps have should have stayed a tent or food truck. A brief online search shows that at least ten Tom + Chee restaurants have closed, with about 31 still in operation. Strangely, some of the Tom + Chee struggles are similar to those currently being experienced by local pizza franchise Uncle Maddio's Pizza. 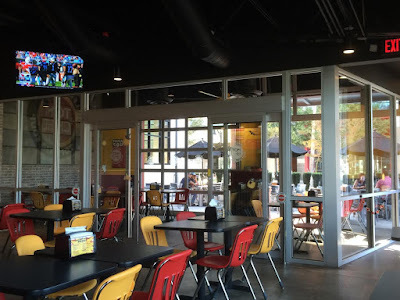 Uncle Maddio's started at Toco Hills in Atlanta in 2009, the same year as the original Tom + Chee tent, and had been aggressively expanding via franchising. Like Tom + Chee, Uncle Maddio's claims to have tons of interest and a multi-hundred unit pipeline of upcoming locations. Both chains may have done too much too soon, with each chain having closed about ten locations, and neither having crossed the 50 unit threshold. In mid 2014, Tom+Chee laid off six employees from its downtown Cincinnati headquarters. "It's something we have to do to make sure we keep growing in the right way," Ward said. "We don't want to get ahead of ourselves." I think they got ahead of themselves. What are your thoughts on the Tom + Chee brand and its Atlanta area locations? 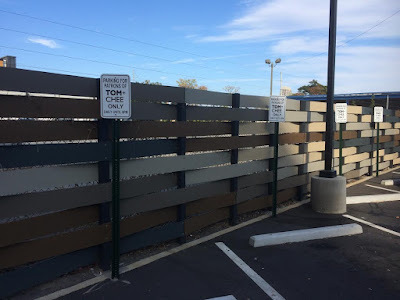 If Tom + Chee locations in Buford and Atlanta are in fact for sale, what would you like to see open in their place, or can the business be saved? What would you pay for a "gourmet grilled cheese" sandwich? To me soup, salad and sandwich shops do best focusing on the lunch time crowd. I remember a place near where I worked that was open for breakfast and lunch, but was closed after 3:00pm and on weekends. I suppose there are folks that might stop by for a soup & sandwich dinner, but it seems like a small group. Maybe refocusing on office parks, medical centers, colleges, etc might attract more business and lower overhead at the same time. I hate to say it, but the food just isn't good enough at Tom + Chee. I was excited to visit the Kennesaw location due to the vegetarian options on their menu, and I really wanted to like it. But the sandwich wasn't gooey, and the cheese should be gooey, right? I also bought a "dipper", since it seemed to be part of the overall experience. The dipper I chose was a chunky tomato soup-type mixture, served in a small plastic container. The sauce was EXACTLY like canned tomato sauce. It was even cold. So, there was nothing I ate that day at Tom + Chee that I could have enjoyed at home in a much better way. Mark Cuban is welcome to come over for lunch if he's ever in the area. FYI for other vegetarians - It's not on the menu, but Chick-Fil-A sells a Veggie Wrap that is tasty and filling. It's basically a salad in a wrap, with cabbage, corn, black beans, grated cheese, etc. I have only been to the Alphareta location. Unfortunately the day I went was a cold rainy Sunday. It was very crowded, no available seats and loud. After waiting over 30 minutes the 2 people I was with got their food but I did not. The staff said my sandwich came with tomato and they were out of it so they just ignored the order. Wasn't happy but would give it another chance if I was in the area. With that said you make a good point about the price point vs rents. I also think a negative is that the food doesn't travel well. My friends took the food to go (since there were no tables available) and it list a lot after just 15 minutes. The future may not be so bright for this concept. 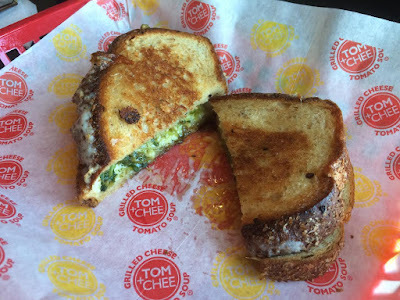 I honestly lost interest in Tom + Chee when they dropped goetta from the menu! That said, there was always a very, very big after-church crowd at the Kennesaw location every Sunday that we visited last year and the first part of this. You are correct about the longevity of this franchise. Poor leadership at the corporate office according to many franchisees. Several franchisees want out.  In the last week 4 locations closed their doors including the one in Atlanta you mentioned in this article. I investigated buying this franchise, but after talking to many current owners virtually no one would buy it again. Many of them purchased multiple locations and refuse to open their second store.